Unlock the mysteries of the East and win with the newest Pragmatic Play slot, Master Chen’s Fortune. Win in every direction and have multipliers too, it won't be long until you will have some great wins on this slot. Master Chen’s Fortune has a classic 3×5 reel and 9 paylines, but there is nothing traditional about this new cutting-edge slot. From its brightly background to its beautifully designed icons, Master Chen’s Fortune brings excitement in every spin. Spin and watch for symbols like oranges, a money tree, a Maneki-neko, Chinese characters, a vase and the Wild Master Chen himself, many of which represent good luck in Eastern cultures – and also could mean huge wins for you! 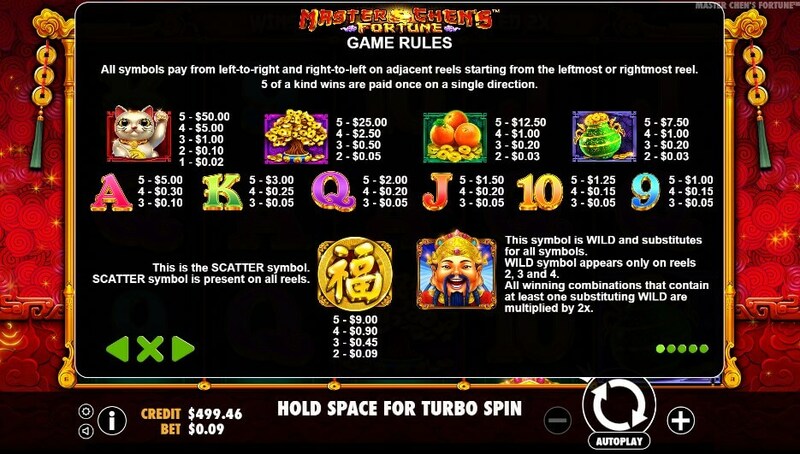 Master Chen’s Fortune slot has a feature rewarding multiplier but also multiple ways to win as well, with wins paid in both left to right but also right to left. Find the Maneki-neko waving cat scatter, which pays out multiplied by your total bet, and it also offers a 2x multiplier if a wild symbol appears at the same time. Get the Wild Master Chen symbol, appearing on reels 2, 3 and 4, and any other win it you have in will be 2x multiplied – so the more you bet, the more you could change your fortune with Master Chen!